In the Illinois Supreme Court case of In re Michelle J., the State sought to involuntarily extend a patient’s stay at a mental health facility and to involuntarily admit another patient into a different mental health facility. Before delving into the legal issues and reasoning underlying the eventual ruling on these matters, however, some exploration into the background of both cases is critical. In the case of the first patient, Sam S., the controversy surrounded around whether or not his stay at the mental health facility should continue. He had already been involuntarily admitted several years earlier under the Mental Health and Developmental Disabilities Code (the Code). In 2001, the State initiated a hearing to establish that his stay should be extended. Pursuant to the Code, Sam decided to waive his right to attend the hearing. At the hearing, the State called the chief psychologist, Debra Ferguson, of the Alton Mental Health Center to lay a basis for his continued involuntary confinement. She stated she had never treated him at any facility, that she could have interviewed him for the hearing in question a few weeks prior but failed to do so, and that her determination for recommending his continued confinement was based solely on a review of his medical records. The case of Michelle J. was a bit different than that of Sam S. She was admitted to a mental health center on an emergency basis. So, her controversy rested on whether she should be involuntarily confined there at all. At her hearing, the State called Lenora Brown, a clinical psychologist at the same Alton Mental Health Center. She testified that she attempted to interview Michelle J. but that the patient appeared to lack the capacity to answer her questions. However, Brown also actively took part in the treatment of Michelle J. and had personal knowledge of the medical issues affecting her. Therefore, the issues presented to the Illinois Supreme Court were 1) absent a waiver of the testimony rule, was the State’s proffer enough to satisfy 3-807 and justify the confinement of Sam S. and 2) absent a waiver of the testimony rule, was the State’s proffer enough to satisfy 3-807 and justify the confinement of Michelle J.? Taking a cue from the appellate court’s ruling, the State offered several points to justify the continued detainment of both Sam S. and Michelle J. First, while the mandate of 3-807 is “highly desirous,” it argued that an actual in-person consultation is not completely necessary to fulfill the requirements of the statute. Also, referencing In re Barbara H., the State noted times where the Court did not always require such expert testimony. 183 Ill.2d 482 (1998). Finally, it argued that neither Sam S. nor Michelle J. invoked or cleared the clear and convincing standard found within 3-808 of the Code. The Court responded to each of these in turn, but analyzed all of them under the rubric of strict statutory construction. 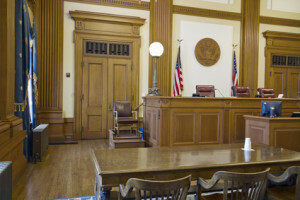 Section 3-807 requires either expert testimony in person at the hearing by someone who has examined the patient, or a waiver by the patient of such testimony. The language offered by the appellate court ran afoul of the statute’s actual words. The testimony is more than “highly desirous,” it is required. Further, the case of Barbara H. presented distinct factual differences than that of either Sam S. or Michelle J. There, despite trying on a number occasions, an examination with the patient was impossible. The Court emphasized that this was an exception to the general rule requiring examinations prior to 3-807 testimonies. Finally, absent the State’s clearing the threshold of 3-807, the Court realized that the patients should not be obligated to pass the 3-808 clear and convincing hurdle. Applied to the particular circumstances of Sam S. and Michelle J., there was mixed results. With the former, the Court noted that the only experience Debra Ferguson had with the patient was secondhand, through a review of his medical records. She did not treat him, she did not examine him for the purposed of the hearing, and she did generally know his condition other than through the information provided by others. The Court found that this could not comport with the 3-807 expert testimony requirement. On the other hand, Lenora Brown had significant experience with Michelle J. She was a part of the treatment plan provided to this patient and had consultations near in time to the hearing. The Court found this distinct from Sam’s case and in compliance with 3-807. 1) Without a waiver, the State’s offering of Ferguson’s testimony was not enough to fulfill its 3-807 requirement, and thus continue to hold Sam S. involuntarily, because Ferguson did not have any personal experience with or examinations of the Sam S.
2) The State’s offering of Brown’s testimony was enough to fulfill its 3-807 requirement, and thus admit Michelle J. involuntarily, because Brown personally treated Michelle J. and consulted with her near to the time of the hearing.